Going to use this thread as an oil change diary for myself to keep track of what oils I've tried and what my bike likes and doesn't. I've tried a few different oils with the L in the last year, some make shifting easier and smoother and some make it rougher. Everyone has an opinion on what the "best " oil is and I've always felt that is hard to determine as different engines and clutches play differently with different products. 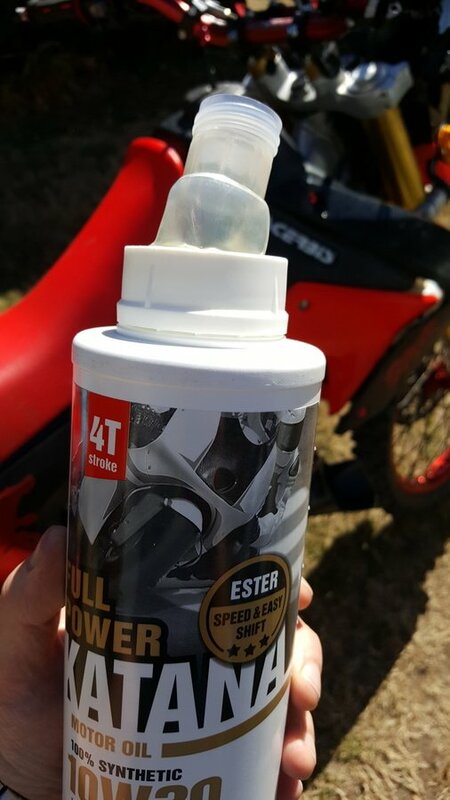 For example last summer I had some cheaper 10w40 mineral oil and my clutch loved it, really smooth shifting. Next oil change I went with a $90 jug of Motul Synthetic 10w30 and my clutch hated it and shifted somewhat rough between gears 1-3, particularly when downshifting. Just did an oil change and used some iPone 10w30 synthetic. Going for a ride tomorrow, we'll see how the bike likes it. Excellent idea for a thread. When I first saw the topic I thought Kompact doesn't know how to change oil??? I used the regular Honda oil (GN?) first change and it loved it. Second time I think semi synth Golden Spektro and it wasn't as happy. Interestingly this has been the oil I use in my R1 from it's second change and it loves it, no vibes, no clunky trans. Changed it at 600 miles, then at 1400 miles with Honda GN4. Then switched to Honda Pro HP4S full synthetic 10W30 on the 3rd oil change and the LRP has been golden ever since. Filter change each time. I have been running Maxima Pro Plus 10W-30. No issues. This is what I did, but changed the oil at 100 and with a clutch upgrade at 500. Then HP4S every 5K or at the end of the season. Local dealer stocks it and puts it on sale occasionally, have this and the wife's CB300F that shares the same oil and filter parts, so easy to stock up for both. I do 2k km changes with Lucas 10/40 Dino, bike seems to like it and shifts smooth. It 10$ a litre at cdn tire. I just can't bring myself to use oil that is not the specified weight for what I am changing the oil on, whether it be on my cars or the CRF. The oil journals (oil paths) are of a specific diameter and intentionally designed that way by the engineers designing the part. It may not seem like there is a big difference between 10w30 and 10w40 by look and feel by human observation, but to the journals, it can make a big difference on what is going on constantly inside the LRP engine. It's all about the oil viscosity (thickness) and the path diameters. Just not willing to take a chance on different weight oils, which is the blood of the engine. This is not a bash against Cyclic at all, as I have read of many different brands and weights of oil being used in the LRP. It is an oil thread, so I'm just putting in my two cents which may or may not be worth a dime. I was looking at 10w30 oil at my Honda dealer in the UK. The guy there said they use 10w40 for all bikes that come in for a service as it suits our climate better so that's what I went with. I got 4 litres of full synthetic castrol power 1 racing for £40, the semi-synthetic castrol was £38. The Honda oil was more expensive. Actually service Mgr told me to run 10w40 in it, so I did and believe the whole 10w30 is for CAFE fuel economy. I am on our side being a CRF owner myself. I would not think that climate has anything to do with it. The LRP engine gets hotter in two minutes than any normal rideable climate that I am aware of on Earth. I agree with Cyclic that 10W30 oil does result in better fuel economy than 10W40 oil...but what would make that happen ? Just changed mine at 530 miles and used Valvoline 10w40 motorcycle oil,been using that oil for many years. 10w40 is more viscous (thicker) than 10w30, so it results in more work to move all the engine parts. I think that the fuel economy would be marginally better with 10w30, but not by much. Not much. I am getting 35 km/l on average on traditional 40w dino oil. Thank you for your response and I believe it is correct. It was my point all along that it is harder to push the thicker 10W40 oil through the oil pump and journals that are sized for 10W30 viscosity. At least we are all changing our oil when it is time, instead of blowing it off, which is much worse than using a thicker oil than recommended by the manufacturer. Sure thing Dogger! I think most of the people in this forum will change their oil more frequently than the service manual indicates, so 10w30 or 40 will be just fine. I use the Honda full synthetic 10w30, and haven't had any issues. It will be interesting to see the experiences of others with different oils. You bet ! I use the same oil you do. It would be interesting long term to see if either the 10W30 or 10W40 engines start consuming oil and become a "smoker" bike. At 5000 rpm's, the piston is completing one cycle of up and down 83 times per SECOND...if my math is right (5000 rpm 60 seconds = 83). Proper lubrication needed for sure. Take care. I just can't bring myself to use oil that is not the specified weight for what I am changing the oil on, whether it be on my cars or the CRF. The oil journals (oil paths) are of a specific diameter and intentionally designed that way by the engineers designing the part. It may not seem like there is a big difference between 10w30 and 10w40 by look and feel by human observation, but to the journals, it can make a big difference on what is going on constantly inside the LRP engine. My dealer says the same thing. @MotoTribology Would love to hear your thoughts. Car oils had been blended using more and more friction modifiers, which, although good for cars, wasn’t too good for motorcycles as these modifiers can cause clutches to slip at higher revs and gearbox pitting. I can understand wanting to use 10w30 if that is what honda spec for this bike. 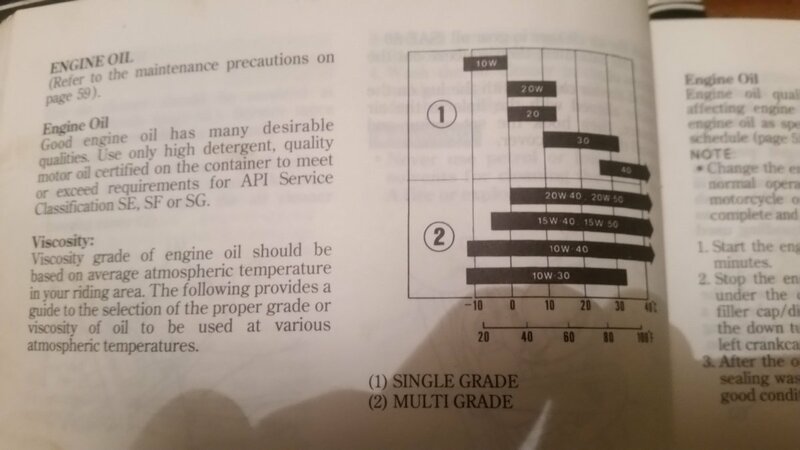 Honda used to have an oil chart in their owners manuals for you to choose the oil that best suited your climate. But it was confusing because who knows their average atmospheric temperature. Maybe it is just simpler for them to state a specific grade.